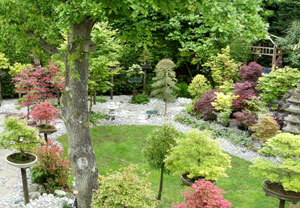 All of this information on our website www.japanese-garden-design.com has been exhaustively researched and to the best of our knowledge, is wholly accurate at the time of its publicaton. However, it is important to note that www.japanese-garden-design.com does not warrant the completeness as well as the accuracy of this information, both in text form and images, within the pages. This is nothing more than an oriental gardening website designed to inspire you into landscaping your garden in this way, perhaps with maples, bamboo and a koi carp pond, not to mention stepping stones and bonsai trees. In no event shall www.japanese-garden-design.com be in any way liable for possible indirect or special consequential damages or indeed any kind of damages. If you are using a digger to create a pond, then do it carefully or use someone with experience. If you are digging a hole, then be extra careful if you suffer from a bad back. And if you are using a sharp pair of secateurs, be sure that you keep your fingers well out of the way when you prune! Use commonsense at all times and consult with experts if you need to. This statement includes any loss of data or profits, (this means in action, in contract or tort) that may possibly arise as a result of reading and acting upon information within this Japanese Garden Design website. The content should be treated 'as is', without any warranty, representation, condition or undertaking, either express or implied, statutory or otherwise. This means without limitation, the warranties of merchantability, non-infringement of intellectual property, etc. That is the legal stuff out of the way, but it did need to be said. This is, as mentioned, nothing more than a website about the enchantment of a Japanese Garden, one of the true wonders of the horticultural world of garden design and landscaping. We have taken all of the photographs ourselves, many of which have actually been taken within our very own version of a 'Westernised' oriental garden. If you think that any of the pictures may have been taken by you, then rest assured that they definitely have not been. Thank you so much for taking the time to read all of this spiel and most importantly, enjoying reading the other website pages and looking at the images. And if you are going to create your own oriental wonderland in your back yard, perhaps using some of our ideas, then please do let us know and send us some photos.